Defined in Japanese as 春らしくなる; something becoming spring-like. For example in terms of weather, this could be the days getting longer or the temperature increasing. 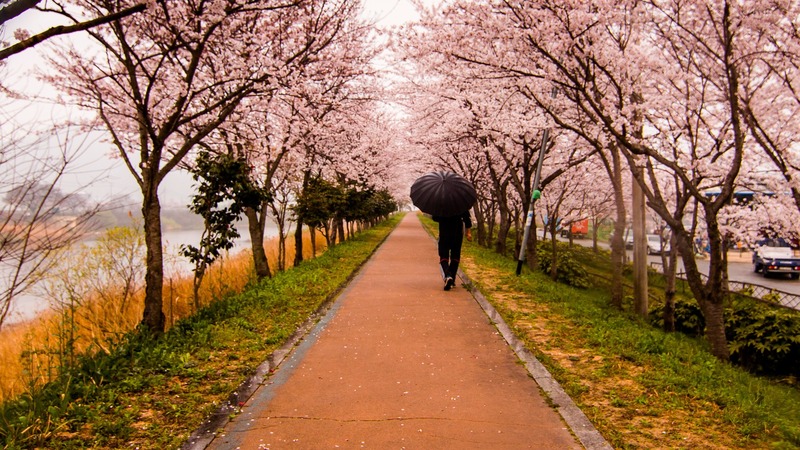 I thought I would seize the opportunity to write about a couple of the most common words and phrases associated with spring in Japan. This post will focus on 桜 (sakura) and 花見 (hanami). Whilst the arrival of 梅 (うめ ume; plum blossoms) happens earlier, the blooming of cherry blossoms, or sakura, is the event which truly indicates that spring has arrived in Japan. There is a lot of anticipation for sakura as sadly, the blooms usually last for less than two weeks. As such, the sakura hold a special significance in Japan as they reflect the transience of life, a key teaching of Buddhism. Additionally, in many areas of Japan, the blooming of sakura coincides with the start of the new academic year and is often the time when people begin new jobs. For this reason, the spring and sakura also represent a time for new beginnings. The build-up to the blooming of sakura begins with the sakura forecast. The sakura forecast starts showing on TV alongside the weather forecast in February, indicating rough dates of when you can expect to see cherry blossoms depending on where you are in the country. Knowing this in advance gives you as much time as possible to start making important plans, namely for 花見. Spring in Japan means 花見 (はなみ Hanami; flower viewing) time! The arrival of sakura is as good excuse as any to celebrate, and what better way to do so than to sit under the blossoms to eat, drink and be merry? The practice of hanami is said to date back to the Nara period in the 8th century and was initially associated with the flowering of the aforementioned ume plum blossoms. Once a practice restricted to the imperial court, it later became commonplace for everyone to take part in. Hanami remains a popular tradition today, with people gathering early in the morning to lay down a tarpaulin and secure the best area at popular hanami viewing spots. Hanami parties with friends, family or co-workers involve plenty of eating and drinking. Easily shareable food such as onigiri and yakitori are popular hanami choices, as well as beer and tea. It is a great time to enjoy bento and limited edition snacks only available in spring. These special springtime snacks include 花見団子 (はなみだんご Hanami dango), special Japanese style sweets related to もち. During hanami season, 団子 are available in the 3 colours commonly associated with sakura; pink, white and light green (also known as 三色団子 さんしょくだんご; three colour dango). Unfortunately, spring in Japan has a slight downside. The arrival of flowers means the arrival of 花粉症 (かふんしょう kafunshou; hayfever. Those that are afflicted with hayfever will need to stock up to make sure they can make the most of hanami and the rest of the spring season. So that is all for today. What is your favourite thing about spring? Let me know in the comments!